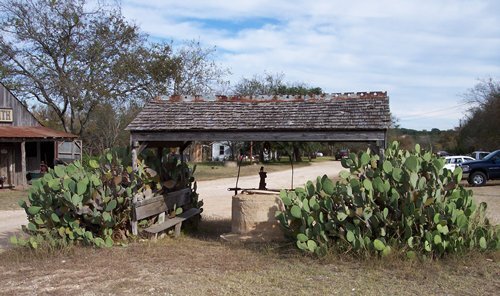 Recently there have been two authentic Texas ghost towns in the news. 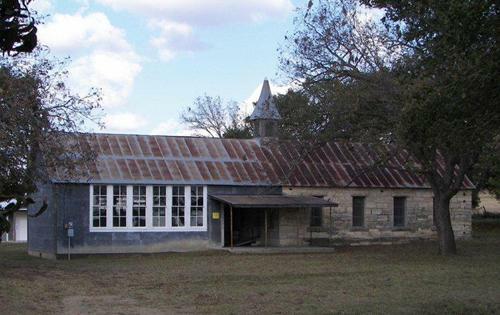 Albert, Texas in the Hill Country (just East of Fredericksburg) and The Grove (SW of Waco between Temple and Gatesville). The Grove comes with a less acreage, but a few more buildings. If you call in the next fifteen minutes, they�ll throw in a huge collection of antiques and artifacts collected since the early 1970s. We were told that whenever a period movie was filming in Texas, and they needed some authentic prop or piece of vintage equipment, they�d often check with The Grove. The hearse from Lonesome Dove is included in the inventory. The Grove also functions as a weekend attraction and may be well on the way to becoming the next Luckenbach (not for sale). 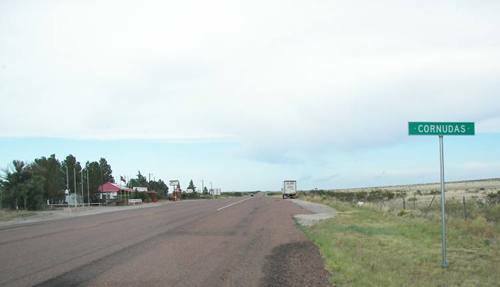 Over the years there have been other Texas towns for sale, notably Cornudas in Hudspeth County (70 miles East of El Paso) and Lajitas which is down on the Rio Grande (90 miles south of Alpine and is just outside the boundaries of the Big Bend National Park). 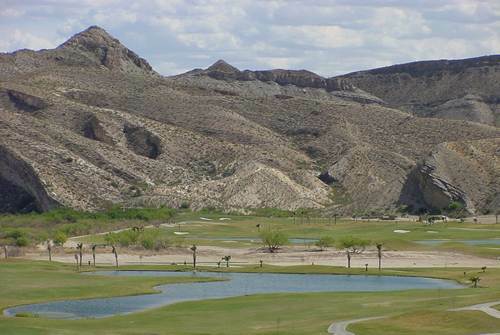 Lajitas is now a sort of fly-in golf course and resort. The irrigated greens make it impossible to miss from the air. The �town� reportedly sold for something like 4.2 million in 2000. After pumping a reported $100,000,000 into the place, it went into foreclosure in 2007 - $18 million in debt. It can be assumed that the old motel and service station that once made up tiny Lobo, Texas (65 miles NW of Marfa on old US 90) sold for considerably less than Lajitas did. Lobo was bought by a group of Germans. Lajitas remains on the state map as does Cornudas and Lobo. Albert and The Grove do not. I think it has to do with how much room the cartographer has to work with. Despite the current surge in road trips by Baby-boomers trying to make sense of their childhood memories from behind the windshield of Titanic motor homes, and the popularity of motorcycle clubs, the �Golden Age� of the quaint and curious �roadside attraction� is over. TxDOT sells maps which show the traffic counts of almost every road in the state, so before you start entertaining dreams of rattlesnake farms, prairie dog villages or longhorn timeshares, you might want to see how many people actually pass these places. Don�t forget to factor in both increased gas mileage and the incurious younger drivers of today. Times have changed, and while movie writers and directors perpetuate the iconic roadside diner � those places are long gone. But for those seeking solitude and a peaceful existence in a place where people have moved on � there are hundreds of towns that (while not being �authentic� ghost towns) remain under-inhabited and would offer a similar lifestyle. They might even provide some amenities � like water, electricity and cranky neighbors. When investigating towns like these, one would be wise to check-out the current residents (who might not enthusiastically embrace an increased population). They, like you, may have moved here to get away from people. Our suggestion to people with a ghost town / roadside attraction fantasy would be to consult a model train catalog. Then buy a large piece of plywood, order the tiny buildings, paint in the roadways, install the infrastructure and then when the town looks like it�s going to prosper, remove the railroad tracks or bypass it with a new highway. 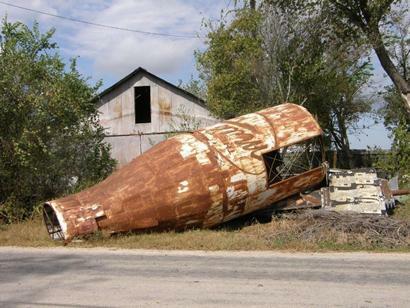 It�s how most Texas ghost towns were made. or "Things Are Tough All Over"
In a December 8th 2007 San Antonio Express News article entitled Bankrupt Resort Ordered Sold, staff writer John MacCormack wrote of Lajitas, calling it the �ill-fated� resort that �swallowed� $100,000,000. The developer may have over-estimated the need for such places. These days most people seeking hideaways simply move to countries without an extradition treaty with the United States. The resort (and the 25,000 acres that come with it) had a foreclosure bid of 13.5 million from a single investor. It also reported that the resort is 18 to 20 million dollars in debt. A final decision on whether or not the sale proceeds is expected around the New Year. Our thanks to Terry Jeanson of San Antonio for this update and to David from Buckholts for the correction. - Ed.